An antique Chinese bowl fetched a whopping $38 million at auction on Tuesday. The purchase of the 900-year-old bowl, which was fashioned during the Song dynasty, sets a new auction record for Chinese porcelain, auction house Sotheby's said. An anonymous buyer placed the winning bid of 294 million Hong Kong dollars ($38 million), clinching the piece after a 20-minute bidding war in Hong Kong. 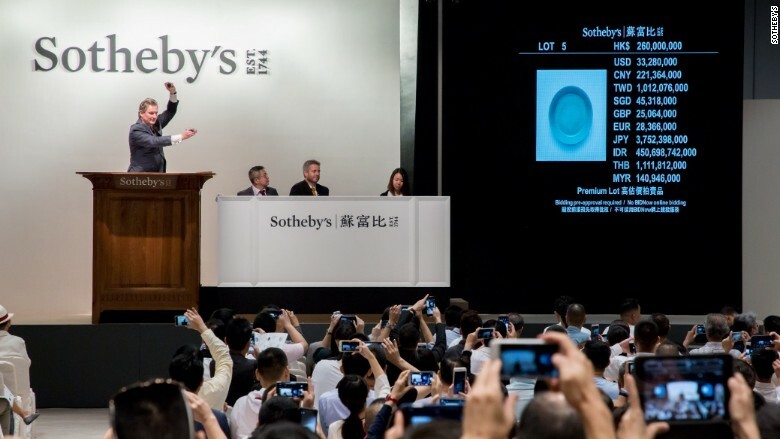 The bowl had been expected to go for at least 100 million Hong Kong dollars ($13 million), according to Sotheby's (BID). 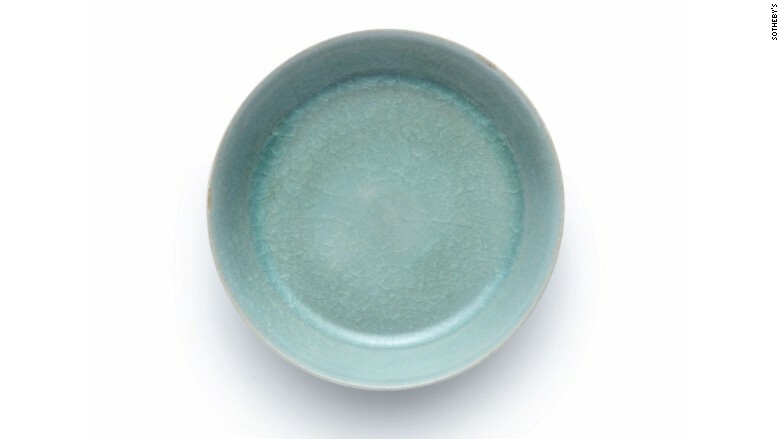 The auction house touted the blue-green "brush washer" as "a highly important and extremely rare" piece of art. Brush washers are shallow porcelain bowls that were used in ancient China to clean calligraphy and paint brushes. An anonymous buyer clinched the bowl after a 20-minute bidding war in Hong Kong. The multimillion-dollar bowl comes from the once-famous kilns of Ruzhou, situated in what is now the central Chinese province of Henan. It dates from the late Northern Song dynasty, which lasted from 960 to 1127. The style of the bowl is known as Ru guanyao, or Ru "ice crackle". The look is accomplished when pieces are pulled from kiln fires and the different contractions of the pottery and the glaze cause cracks during the cooling process. Ru porcelain is known for the cracked glaze's ability to reflect light. Since 1940, only six Ru ceramics have appeared at auction. The last piece, another Ru "ice crackle" bowl, sold at Sotheby's for 208 million Hong Kong dollars ($27 million) in 2012.